I almost didn’t post this because I don’t really like the pictures. But if I’ve learned anything in my three years of blogging, it’s to JUST POST IT. What’s the worst that can happen? Someone doesn’t like strawberries, lemons, or cake? That’s totally their problem. So, at the very least, I decided I’d just show you guys the cake I made for my family’s Easter get-together over the weekend. 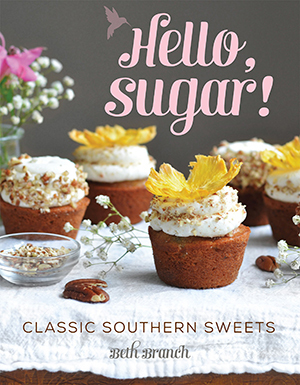 I knew a few weeks ago that I wanted to make one of the cakes from the April issue of Southern Living. 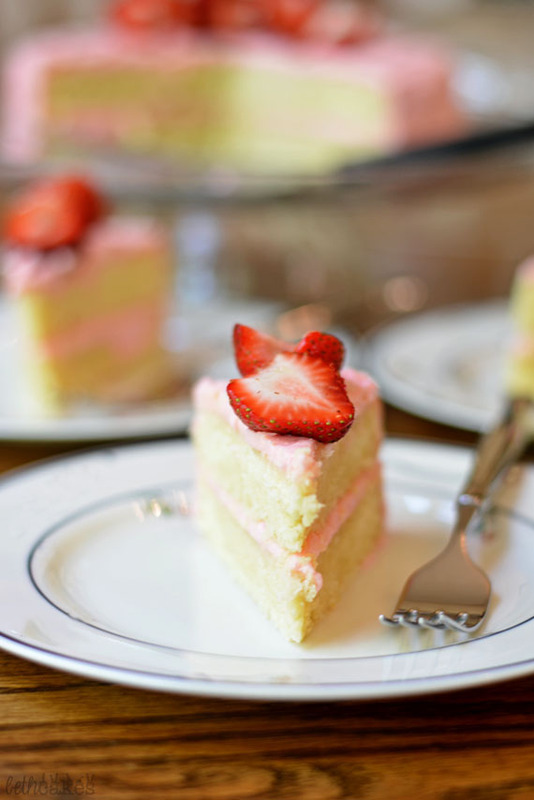 It was either this Strawberry Lemonade Cake or this Strawberries-and-Cream Sheet Cake. They both use the same frosting, but it doesn’t have very good reviews. 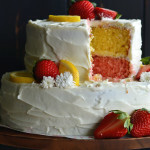 So it came down the cake: strawberry or lemonade!? 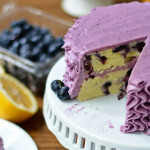 I went with lemon just so there’d be more flavors, but that sheet cake is still calling my name. That one may have to happen sometime in the near future. 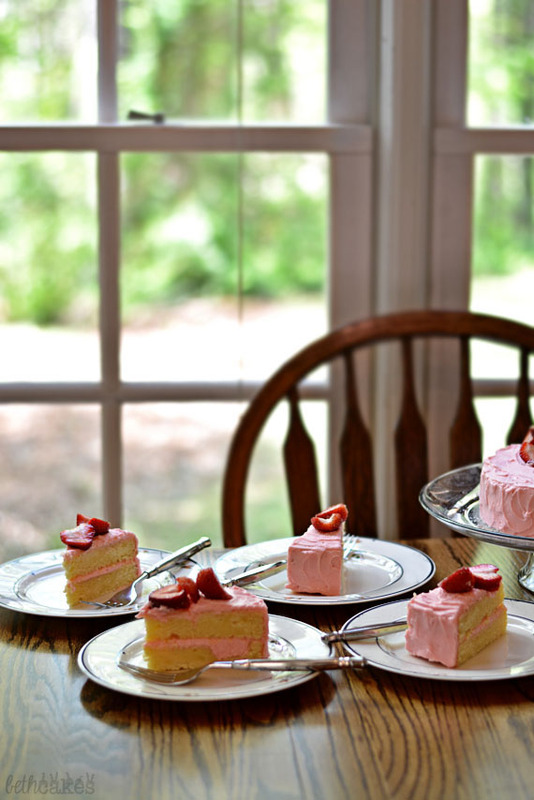 The only thing about the Strawberry Lemonade Cake…I don’t have a cake stand with a cover that will hold a four layer cake! So I prepared the cake batter a little differently. Partially because I didn’t read the directions all the way through and just tossed all the eggs in the batter instead of adding the yolks, whipping the whites, and then folding them in. I think because I didn’t whip the whites, the batter wasn’t as fluffy, and it surprisingly all fit into two 9 inch cake pans. I also didn’t make the Strawberry-Lemon Jam because I was a little short on time. I’m not really jam-filling kind of girl either, so I was just fine adding more frosting between the layers. Other than preparing the batter a little differently, the only other thing I changed was to use 1/4 cup fresh lemon juice instead of one tablespoon. What I was really excited about was the strawberry frosting. 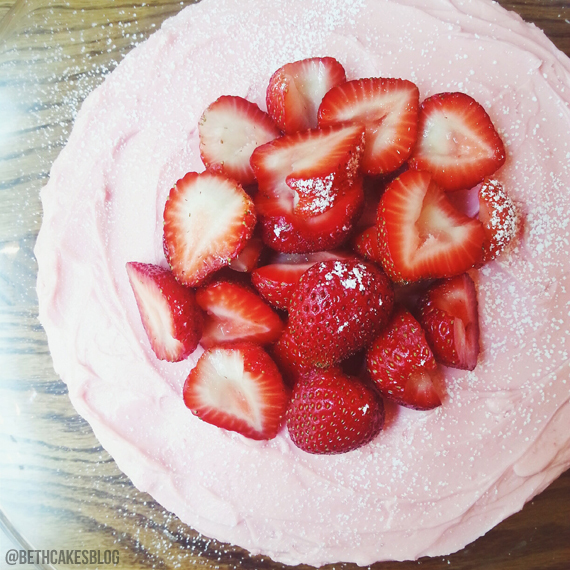 I’ve only made strawberry frosting once or twice, but it was sort of…goopy. It was supposed to be like that a little bit, though. The recipe directions said to just “pour” it over the cake, so it wasn’t good for piping. Or even spreading it out in a pretty swirly pattern. But this frosting? Totally dreamy. Smooth, spreadable, creamy, and bursting with strawberry flavor. I started with two sticks of butter, a couple tablespoons of seedless strawberry jam, tons of powdered sugar (as you do), and a couple tablespoons of strawberry puree with the seeds and solids removed (you know how I am about chunks of things). Prepare cake according to instructions. 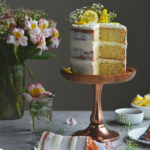 Or if you'd like to make this two layer cake, add in the whole eggs where the recipe says to add it in the yolks. Then use 1/4 cup lemon juice instead of 1 tablespoon. Bake in two greased 9 inch cake pans for 20-25 minutes. In the bowl of a stand mixer, beat butter on medium-high speed until smooth and creamy. Add strawberry jam and mix until it's completely blended in with the butter. Add half of the powdered sugar and mix on low speed until mostly combined. Mix on medium speed until completely combined and there are no lumps. Repeat with the second half of the powdered sugar. Spread frosting between and all over cooled cake layers. Topped with fresh strawberries! Ohh this looks amazing! 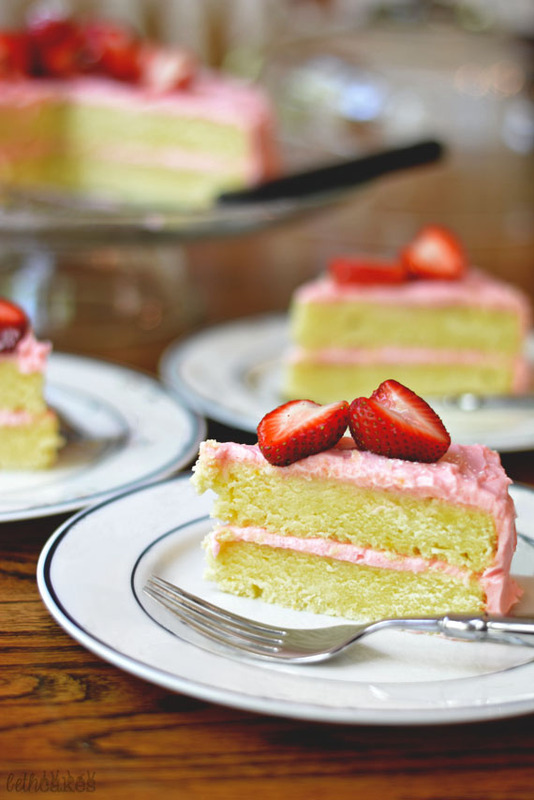 Love Strawberry Lemon Cake. I must try that frosting. Lemon and strawberry definitely screams spring! This cake is so pretty! 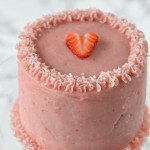 I love strawberry frosting – and the pretty color gets me every single time! Strawberries and lemon, yes please! This sounds perfect not just for easter, but for all summer! 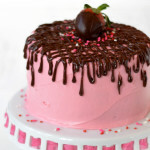 I love the pretty swirls of icing- especially because OMG PINK. Mmmm this is the epitome of spring right here! Loving it! 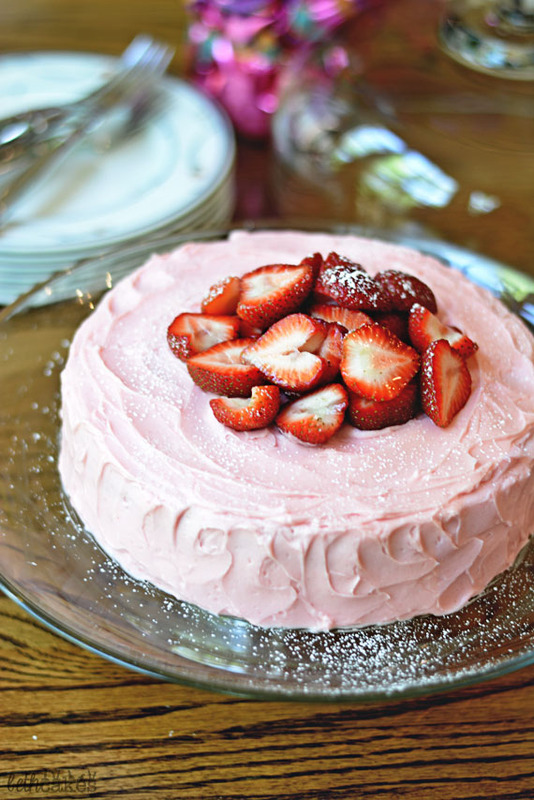 Such a beautiful cake… I can’t wait for strawberry season here in NY. Just another like 2 months!!! Only like 2 months!? ONLY? I’m so glad you decided to post this, because your cake looks lovely. Especially the strawberry buttercream. With the combo of strawberry jam and fresh purée, it must be delicious, not to mention that it’s gorgeous! This cake looks and sounds beautiful! I’m really glad you posted it because it’s so different from what I’ve been seeing and it’s so springy! Frosting and I are sworn frenemies because anytime I think I have a good idea (and I LOVE fruit, so I’m always trying to put it in frosting), it ends up runny until I have to cram so much sugar in there I don’t taste anything else anymore. I have a go-to plain whipped cream/cream cheese frosting that has never failed me, but this looks amazing and I’ll have to try it! I’m sure glad you posted this Beth it’s so pretty and looks yummy! Perfect for Spring and Summer. You’re crazy, Beth. I think these photos look lovely! And the frosting is such a pretty shade of pink. 😀 Perfect for Easter (or any time in my opinion lol). I hope you had a lovely Easter! Beth, the first thing I thought when I saw that first photo was, I love these photos!! I’ve been there though and hate posting/not posting something because of photos but you totally have nothing to worry about. 🙂 This cake looks so yummy and I love the pairing of strawberry and lemon! Scrumptious! Just a beautiful & scrumptious cake! I honestly think that these photos are beautiful, Beth! So glad you posted the cake in the end. It’s gorgeous in every way – your family were very lucky indeed this Easter! You made a good choice! Although both of the other cakes sound incredible as well. Now I have to pick! 🙂 What a gorgeous cake, Beth, and the flavors are a match made in heaven! I am obsessed with strawberry and lemon! So glad you still posted this – and I can’t believe you don’t like your pictures – they are amazing! Your photography is always stunning Beth! Pinning this! I am so glad you decided to post this! Your cake looks absolutely lovely… I want a piece asap! This cake just screams summer. Oh my goodness. This cake looks amazing. I can’t wait to try this strawberry frosting!! OOh, totally pinning! We are so hard on our pictures, aren’t we?! 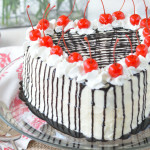 But I’m so glad you posted – the pix are great and the cake looks and sounds delicious!!! 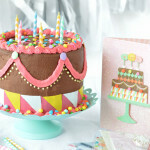 What a perfect cake for spring / summer! I’m glad you decided to just go ahead and post! I think we can be so hard on ourselves as bloggers to have everything perfect, or we don’t want to share, but most of the time we’re just being too critical of ourselves! 😉 The cake looks lovely and delicious! What are you talking about, girl? These photos are beautiful! And your cake looks perfect. I’m glad all the changes you made yielded a cake both gorgeous and delicious. I really need to try that strawberry frosting – it seriously looks amazing.